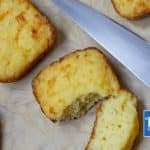 Keto Biscuits Recipe - "Low Carb Buttery & Fluffy"- Easy Three Cheese! This delicious Keto Biscuits Recipe makes fluffy and buttery biscuits, perfect for mopping up the sauce on your plate. They also make great sliders! Preheat the oven to 170C/340F. Prepare a 12 hole muffin or segmented brownie pan by spraying with a little olive oil. In a large mixing bowl, add the almond flour, salt and baking powder. Mix. Mix in the cheeses, followed by the wet ingredients. Spoon the mixture into 12 holes of the greased pan. Bake in the oven for 15-20 minutes, until the tops are golden and spring back when touched. Remove from the oven and leave to rest for 5 minutes before enjoying.